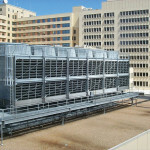 This is Part II of a four-part series on the optimization of evaporative cooling towers. Part I of this series discussed the basics of cooling towers and how process heat loads work, including the amount of water flow needed based on the heat load needs. Here we will discuss how to calculate the effects of changing flow rates and their impact on cooling tower efficiency, particularly the efficiency of fans and pumps. This may sound a bit earth shattering, but if a pump or fan rotates at a slower speed, it will move less air or water than it would at a faster speed. You might ask, how much less? The answer is simple, for every percent the rotation (RPM) changes, theoretically the flow changes the same amount. Did you notice that the only thing I did was switch the way the quantities of air and water are measured? Air is often measured in CFM and water in GPM. It doesn’t matter if you’re talking CFM, GPM, Cubic Meters per Second, Milliliters Per Hour, etc., the Affinity Laws really don’t care. So if you change the speed 50 percent, you change the flowrate 50 percent, subject to static head, a consideration that is beyond the scope of this article. So, consider this scenario: Let’s assume we have a 40 horsepower pump running at 3,600 RPM with a flowrate of 250 Gal/Min and a pressure of 55 PSI. After performing our heat-load calculations and considering static head, we determine that we can reduce the flow rate to 125 GPM at a motor speed of 2,500 RPM. What would be the new pressure and horsepower? The Affinity Laws provide us a mathematical relationship between RPM, pressure and horsepower. (They can also help us understand things like what pump impeller diameter or pulley size for a fan we need in order to get a certain flow). The Affinity Laws specify that speed, flow and even pulley diameter are all proportional to each other. This means that a percentage change to one of these values causes an exact amount of percentage change in the others. In this case, a speed change of around 30 percent also causes a flow rate change of around 30 percent. Although speed and flow rate are proportional to each other (subject to static head), this is not the case with pressure and horsepower. When flow and speed change, a much larger change happens in both pressure and horsepower. Going back to our example, our pump pressure at full speed (3,600 RPM) is 55 PSI. Now that our RPM is reduced to 2,500, what is the new pressure? (3600 ÷ 2500)² = 55 ÷ ? So the new pressure would be roughly 26.5 PSI. You can see we have a much greater ratio of change in pressure than we did with RPM. Although the RPM only changed about 30 percent, the pressure changed by over 50 percent. Once again, it does not matter what units of measure, whether feet of water column, BAR or whatever the ratio of change, the formula is still the same. Wow! A 30 percent decrease in RPM results in a little more than 66 percent decrease in horsepower. For energy-saving purposes, how much energy did we just save? Since theoretically each horsepower represents around 746 watts our reduction is (40-13.4) = 26.6 then times 746 = 19,843 watts or 19.943 kilowatts or, if you like, the equivalent of around 200 100-watt light bulbs. So summing it up, by reducing the flow and RPM by around 30 percent, we reduce pressure by around 50 percent, and the horsepower and the energy we use by around 66 percent. It should be obvious, but it’s still worth mentioning … As wonderful as the savings were due to the tremendous horsepower reduction by reducing the flow rate, the opposite occurs when you go the other way. For example, if all of the sudden you realize that you need more flow than what was designed, the horsepower must then be increased at a substantially greater ratio than the flow. Lastly, it’s also worth mentioning that the actual savings by reducing speeds of the motor will usually be slightly less than the theoretical values shown here. This is because as the speed changes on a fan or pump, the efficiency curves change as well. This change will alter the calculations a little bit, and energy savings will usually be slightly less than calculated. Overall, you can understand why variable speed drives are popular. It is almost like a free lunch because for every amount the flow is reduced, a far greater percentage of the horsepower and energy is also reduced. This is the reason why installing variable speed drives should be considered for any evaporative water tower optimization. In Part 3 we will discuss psychometrics and how they apply to evaporative cooling towers. John Pitcher is the CEO of Weber Sensors, a 50-year-old German manufacturer of flow products based on the calorimetric principle of operation. Previously he was the founder of Scientific Conservation, which was one of the first companies to use cloud computing for fault detection and diagnostics. Mr. Pitcher’s 40-year career covers many product development and leadership roles in the automation and energy efficiency fields. He can be reached at 770 592-6630 orjohn.pitcher@captor.com.